Wait...What am I Posting About Again? Aren't these plates super cute? Well, the reason I have waited so long to buy them was because I thought I could save some money by making them or some ridiculous Martha Stewart-ish idea I came up with. I have wanted these plates to go in my kitchen. 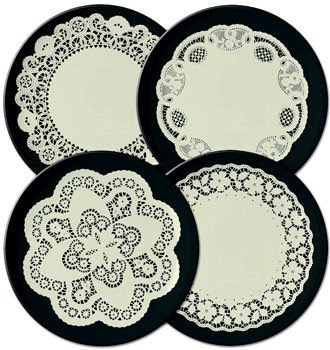 I have a strict decor (black and white damask/doillie-ish, so these would be perfect). I think these would look good hung on my kitchen wall. Well, after a browse through Target about 3 months ago, I spotted the fredflare looking plates. Of course, Scott bought them for me. I thought I was getting a great deal compared to if I paid $40 for them. Here is the kicker of it all. 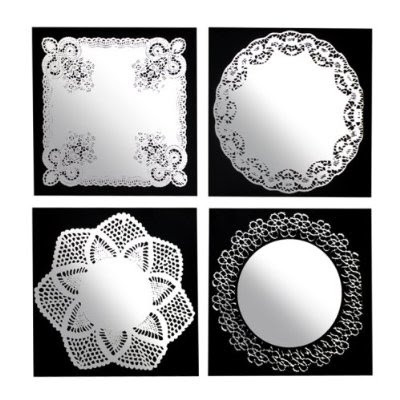 I had these mirrors left out as one of those home projects a lot of Americans do. Like, paint a wall, hang a few frames, build a new room, that sort of thing. And yes, I was also in the middle of hanging up frames on my wall. I set the mirros on the couch to visually remind myself to hang them. When I got back from vacation, the frames I hung above that same couch fell on top of the mirrors, breaking all but one. It didn't just break them either, it shattered them to minuscule pieces where I have to get my couch steamed and clean because if a guest comes to sit, I want safety and not get sued. Plus, the couch I have is beyond vintage. It's an antique Victorian hand carved Mahogany crest, Louis Phillipe style. So that will be a lot to clean up. Scott took me back to Target within the hour and bought me the plates again. Buuut realizing, I could have just purchased those melamine plates that would have withstood the fall of those frames rather than just pay $50 for a set of mirrors. Doh! If I would have not forgotten those plates, they would have been fine and dandy. It gets better. This weekend, while I was away, I forgot my SD card in my computer, leaving me with a weekend of great photo ops and a camera, but no "film". I realized this when we were walking out of the hotel to the concert. We had to buy a new one for $20 at 9pm in Downtown LA, and the only place that had them was a store on Spring, AKA "Skid Row". Not exactly the place to be. (+ side note. this is why i miss new york. it doesn't matter what part of the city you go to, you always feel safe because everything is opened and there are always tons of people on the street. end side note). So that was another $20 spent on my forgetfulness. I am currently staring at least 6 SD cards in an opened drawer of our desk, and there are some we have lying around the house. Another Doh! moment. Don't even get me started at home. Last week, I accidentally put the fresh spinach we just bought in the cupboard. And the milk has been known to be left in other rooms, completely forgotten about until I go for another glass (why do I even leave the kitchen with a gallon of milk in my hand, you wonder? Good question. I wonder that, too.) And who the heck loads and runs the dishwashing machine sans dishwashing soap? Yep, that is I. My favorite part of the day is when I am frantically looking for my cell phone, and yes, a couple minutes later I realize I AM ON MY CELL! nice. Also, lately in the middle of conversation, there are moments where I have no idea what I am talking about or what the other person just said. The other day, I was on the phone with a close friend I have known for over ten years and I forgot her name. I have been known to be a tad forgetful, but this is getting scary. Either, my mind runs on 80mph of my thought process and needs to slow down or I just need to start a little early on something like this. Let me at least have some grand kids before I can start forgetting them. "But everything looks perfect from far away..."